We are back home now and I’m amazing that in the three weeks we were on the road I had so few opportunities to update the blog. While it would be easy to blame it on a lack of good Internet opportunities (which was the case for four days in Death Valley and six days camped up by the San Francisco Bay area if you can believe that), the real reason has been that I often made the choice to spend time with people rather than with the computer. I guess that’s a good sign that my priorities were straight during the trip. We went to Death Valley to be with Airstream friends as much as for the national park itself. Then we migrated to Thornhill Broome beach (Point Mugu State Park, on the California coast) for three days and met other Airstream friends there, and picked up my mother at LAX. 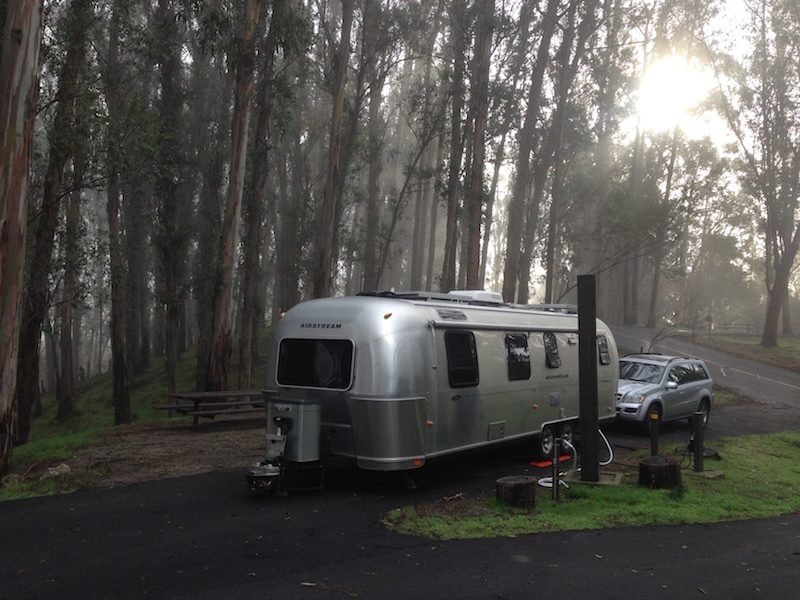 The four of us then towed up to Anthony Chabot Regional Park near Castro Valley CA (east of Oakland) and spent six days with yet another group of Airstream friends (from Europe), attending their wedding and touring San Francisco. Then it was back down the coast, drop off Mom at the airport, and back east toward home. Three weeks fly by when you are traveling and doing lots of things. By the time we got back to Quartzsite for a final night, about to go home to Tucson, it seemed like we just got started. Camping in winter, even in the southwest, presents special challenges. First, you’ve got to pick the right places to go. Snowbirds aren’t interested in encountering blizzards and we definitely don’t want to think about winterizing. So the possibility of snow and freezing temperatures keeps us to the lowlands. Northern Arizona, northern New Mexico, and the Sierra Nevada range are strictly off limits because they are high elevation areas. Most RV’ers seems to cluster around a few reliably warm places strung along I-8 or I-10: Los Angeles, San Diego, Yuma, Quartzsite, Phoenix, Tucson. The Pacific Coast is also OK but it’s hard to camp along the California coast sometimes. There aren’t enough places for everyone who wants to camp on the weekend, and prices are high especially since the state hiked prices at all the state parks. We spent $70 for one night at a decent RV park, which wasn’t an unusual price. The short days of winter and cloudiness from this year’s El Niño storms in California made it hard to rely solely on solar for our electricity when we were boondocking. Even in a less-stormy winter, desert temperatures drop fast at sunset and there’s usually a lot of furnace use. We relied heavily on our catalytic heater because it doesn’t use electricity. In the winter certain problems crop up that you wouldn’t notice in the summer camping season. For example, the propane regulator has been “singing” various songs for a couple of years now, whenever a propane appliance is drawing gas—but only when it’s cold outside. Since the regulator is right outside the bedroom, we were hearing it a lot on cold nights. Eleanor has been asking me to solve the problem for a while but until recently I wasn’t sure whether the tank, regulator, or propane hoses (“pigtails”) was the cause. Turns out it can be either the regulator or the hoses–or in our case both. The noise (which varies from a low humming to an oscillating note) has gotten louder and finally one night it was too much. I found an RV repair place in Ventura CA that stocked our regulator and swapped it out while we were camped at the beach later that day. It’s not a difficult job, taking about 20 minutes if you have the right wrenches on hand. That reduced the noise considerably but I still had to replace the pigtails later to get back to complete silence. I’m adding “replace propane regulator” to our routine maintenance list, once every 10 years. Another challenge of winter is condensation. On this trip the El Niño rains and cool temperatures kept the Bay Area near Oakland right around the dewpoint during the day, and combined with four people in the Airstream it added up to lots of humidity inside. Two or three days we woke up to water dripping from the window glass, and that’s not good. Why? Because that amount of water condensing on the glass means that it’s also condensing in other places you can’t see. Between the two aluminum sheets that comprise the exterior of the Airstream is a layer of fiberglass insulation. Sometimes there are bare patches where the fiberglass has been pushed aside for something else, like an exterior water connection or a speaker in the ceiling. When the humidity in the trailer is too high, the moisture will start to condense on the interior side of the aluminum skin, and soak the insulation. You might not notice this until it gets severe enough to drip out from a seam, but it’s always a problem. Repeated bouts of heavy condensation mean corroded wiring, rotted floors, mold, stains, and smells–all in places that are difficult to access and repair. The solution is ventilation. We didn’t open the windows enough to compensate for four people breathing, washing, cooking, and using a catalytic heater. (The cat heater produces quite a lot of water vapor during operation.) It is counter-intuitive to open the windows and roof vents when you’re trying to stay warm, but you have to do it. Yesterday, five days after the last rain, I removed a ceiling speaker in the Airstream and found water droplets still collected on the aluminum above. Once the moisture gets in there, it takes quite a while to dry out, even in the arid desert of Tucson. Imagine how long it stays—and how much damage it does—if you live in a damper climate. Last year we were towing from Arizona to Florida in February and ran into cold temperatures and rain in Texas. We didn’t winterize the trailer because we were towing along I-10, deep in the south. That episode taught me another lesson about winter travel because along the highway the city water fill froze, cracked, and sprang a leak inside the trailer. Sometimes you just get unlucky. It’s a tricky time of year to do much with a travel trailer, but still the opportunities and cost savings are worth it. 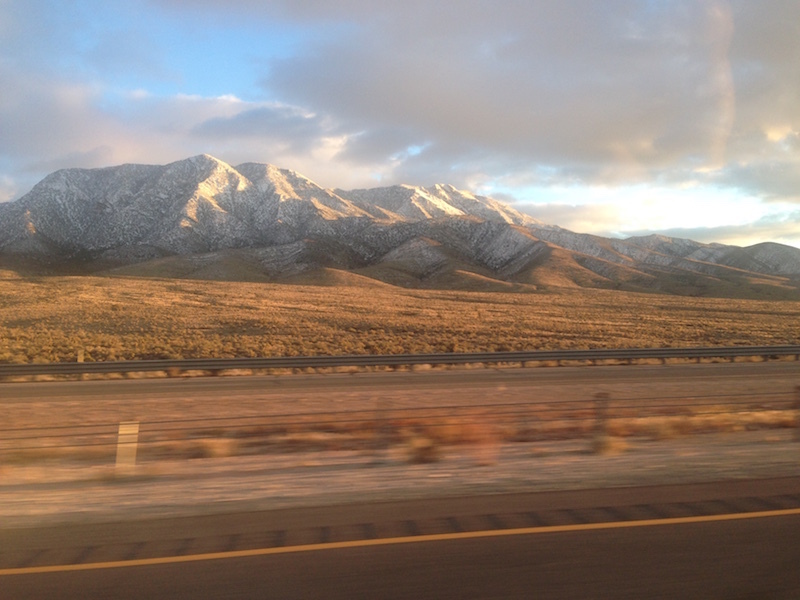 Our trip to Los Death Valley, Los Angeles, and San Francisco wouldn’t have been possible without our Airstream. I’ll just remember that winter makes things a little more complicated … and go anyway.